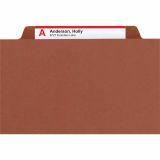 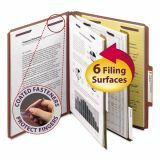 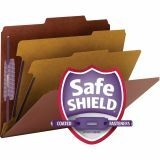 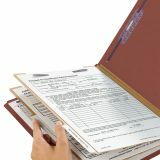 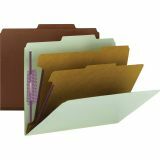 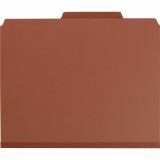 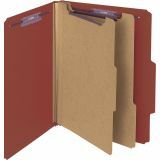 Smead Pressboard Classification Folders, Self Tab, Letter, Six-Section, Red, 10/Box - Smead Classification Folders have a heavy-duty 25 pt. 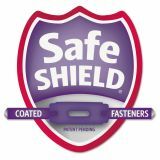 pressboard construction, SafeSHIELD bonded fasteners and accordian pleat made of Tyvek. 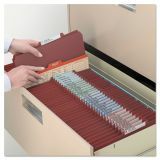 Three subdivisions make information storage ideal for real estate, accounting or personnel files. 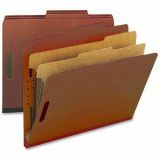 Alternatively, parts of a total file can be segmented for easy referencing. 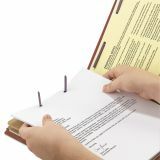 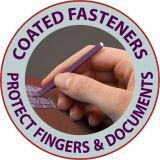 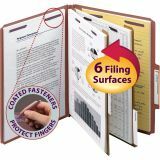 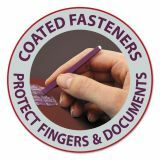 Two-inch "K" style fasteners are bonded to prevent crinkling and to protect both papers and fingers. 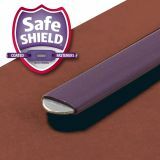 Tabs are 1/2" high with rounded top corners, 2/5 cut and positioned right of center. 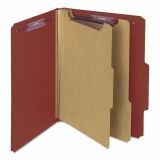 Dividers have 3/8" high tabs and are constructed of 17 point kraft stock. 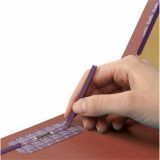 The dividers securely taped to the gusset, with 1" twin prong fasteners on each side.